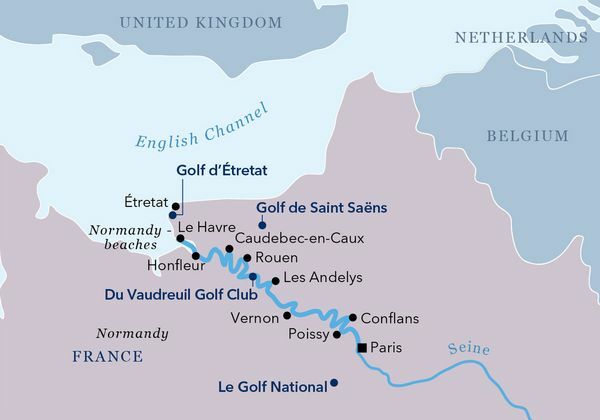 This 8-day GolfAhoy Seine River Group Golf Cruise aboard the AMADEUS Diamond begins and ends in Paris. It combines what is probably the most romantic city in the world with a fascinating journey into the past of the Impressionist masters accompanied by great French golf courses. Follow the footsteps of van Gogh, Cezanne, and Gaugin on this tour along the winding Seine river into Normandy up to Le Havre on the rugged Atlantic coast. Normandy played an important role in World War II with its D-Day landing beaches. Visit idyllic Normandy villages, the “museum town” of Rouen and the picturesque harbor town of Honfleur. AMADEUS Diamond Seine River France Golf Cruise Sept 2019 & Sept 2020. The AMADEUS Diamond is a new jewel on the French waterways. This riverboat travels exclusively along the Seine and allows guests to experience the charm of northern France in an unforgettable way. All 8 suites and the majority of the 68 cabins have French balconies, as well as modern bathrooms. Your culinary needs will be taken care of by the Panorama Restaurant, where you can dine in style, enjoying the luxurious ambiance while admiring the fascinating passing river landscapes. This morning, we reach Rouen, often called the “Ville Musée” (Museum Town) because of the many arts, history, and antiquities museums scattered across the city. The town is also known for the cathedral that inspired Claude Monet, the modern Church of Joan of Arc, with its magnificent 16thcentury stained-glass windows, the “Gros Horloge” (astronomical clock), and the Parliament of Normandy. In the morning, you will be transferred to the Golf Hôtel de Saint Saëns, which is picturesquely situated bordering the Eawy Forest – the largest beechwood forest in France. The Golf Hôtel de Saint-Saëns is situated between Rouen and Dieppe, bordering the Eawy Forest – the largest beechwood forest in France. Designed by architect Denis Robinson, the first five holes of the golf course opened in 1988. The course opened fully in 1989 and has hosted various European championships. The 71-par woodland golf course stretches over 6009 meters and is considered one of the most picturesque courses in Normandy, providing not only a charming setting but also a challenging course with plenty of variety for players, as it is composed of three distinct sections, each of which presents its own unique challenges. From hole 1 to hole 5, the Varenne River flows along the greens and fairways. The next section, up to hole ten, is characterized by a lovely beech and oak forest. Finally, on the other side of the forest, the course opens onto a plateau, with spectacular views of the Normandy countryside and the clubhouse, which is housed in the charming 19th-century manor, “Le Vaudichon”. Alternatively, you can enjoy a full-day trip to the Barrière de Deauville Golf Club. Situated on the heights of Mont Canisy, just outside Deauville, the Barrière de Deauville Golf Club opened in 1929 and is considered one of the most beautiful golf courses in France. Its three 9-hole courses, with a mix of tree-lined and open parkland holes, stretching across rolling terrain, were designed by architects Tom Simpson and Henry Cotton. This is a genuine championship course which has hosted the French Open, the Ebel Match Play and the Air France Madame, as well as players such as Gary Player, Tony Jacklin, and Peter Fowler. It offers stunning views of the sea and the surrounding Normandy countryside while presenting technical challenges that will test even experienced players, particularly on Cotton’s Bleu course, with par 36, which is characterized by its green speed and many bunkers. Simpson’s 9-hole Rouge course fits well with the 9-hole Blanc course, as well as the additional Bleu course. From the Blanc course, usually played as the back-nine of the 18, golfers can enjoy stunning views over Deauville. 20 kilometers (twelve and a half miles) north of Le Havre, situated on the coast of Normandy. Étretat is renowned for its coastal scenery, in particular, its white cliffs. Both the cliffs and the village are scenic highlights of the region and should not be missed. Join us to feel the magic of this place, full of history and legends. This exceptional natural site will take your breath away. Begin with stunning views of the cliffs and rock formations from the clifftop path. Continue with a guided walking tour of the town. Historically a fishing village with medieval houses and fishing cottages, Étretat became a popular seaside resort during the 19th century. Its popularity was enhanced by the large number of famous artists and authors who were inspired by Étretat. Monet, Maupassant, Victor Hugo, and Flaubert were all lovers of the region around the town. Monet painted several well-known pictures of the coast and cliffs around Étretat. It is an attractive, small town where you will have some leisure time, allowing you to browse through the shops and perhaps purchase some souvenirs. From the pebble beach and the promenade, you can enjoy the cliffs on either side once more. Follow your guide and enjoy a stroll through the charming city of Honfleur. This gorgeous maritime city is a town of painters and Impressionism and possesses that something extra that makes it irresistible. The changing light on the Seine estuary inspired Courbet, Monet, Boudin and many others. Your guide will lead you through its narrow streets, steeped in history, and in the footsteps of sailors, painters, artists, and musicians. Stop at the world-famous Vieux Bassin (old port), the Lieutenancy building, from which Samuel de Champlain set out to discover Canada, the Old Salt Stores, and St Catherine’s Church, with its unusual architecture and separate bell tower which was built by sailor-carpenters. Today, dozens of galleries and artists’ studios continue to display a wide range of classical and modern paintings. Honfleur is also the perfect place to find local arts and crafts and specialties such as cider, Calvados, caramels and more. Alternatively, you can simply enjoy your time and relax in one of the little cafes. Today, your vessel anchors in the little town of Les Andelys in the shadow of Château Gaillard, once home to Richard Lionheart. This is the starting point for your golf club visit of Golf du Vaudreuil. In the evening, the captain invites you to his Gala Dinner – a wonderful finish to a fantastic day. The du Vaudreuil Golf Club is situated in a picturesque area with a rich history stretching back to prehistoric times. This countryside was a destination much favored by kings of France, due to its exceptional location in the Seine loop in Normandy. Much later, Marquis Marc de la Haye bought the 90 hectares that make up the golf course today and commissioned renowned English golf architect Fred Hawtree to design the course, which opened in 1962. It has been modernized to suit present-day playing requirements by his son, Martin. The clubhouse, considered one of the most beautiful in France, is a 17th-century barn originally located in the village, which was dismantled and reassembled on the estate. In 2008, Jean-Claude Forestier became the new owner of the club and is responsible for its current excellence, including its classification as a PGA venue. The narrow, tree-lined fairways, water hazards, and bunkers offer suitable challenges for all playing levels. In the early hours of the morning, we will say “Bienvenue” to the French capital once again. The day is yours to explore this romantic city. An included city tour takes you to the Cathedral of Notre-Dame, the Eiffel Tower, and the bustling Champs-Élysées in the morning. In the afternoon, an optional tour allows you to explore the quirky artists’ district of Montmartre and the Sacré-Coeur, located on the highest hill in northern Paris. In the evening, celebrate your golf trip at the Champions-Cocktail with the captain. Josephine Baker sang “J’ai Deux Amours, mon pays et Paris“, referring to her two great loves: her country and Paris. She sums up how most people feel when visiting the French capital, which is one of the most romantic and fascinating cities in the world. The endless number of things to do and places to see means that every­one can find something fascinating to discover in this singular, magical and majestic city. Let your imagination wander as you pass through the streets of this capital, which are imbued with the memory of those who shaped the history of France: Joan of Arc, Louis XIV, Louis XVI, and Napoleon Bonaparte. Your guide will share the daily life of Parisians, and reveal all the secrets and marvels of the “City of Lights”. On the tour, you will, of course, see the most important monuments in Paris. The sightseeing program includes the incomparable Eiffel Tower, the Notre Dame Cathedral, a masterpiece of Gothic architecture, Les Invalides, famous as the burial place of Emperor Napoleon I, the fabulous Louvre Museum, the famous and elegant Champs-Elysées, the Jardin des Tuileries, former palace gardens laid out in the French style and much more. Stroll through the sinuous streets of the tallest hill of the capital with your guide, just like artists such as Picasso, Renoir, Toulouse-Lautrec, and Utrillo have done since the end of the 19th century. You’ll sense the contrasts of this legendary and picturesque place, where wine flowed freely and romance alternated with madness. Louis XIV moved the royal court from Paris to Versailles in 1682. From that time until the beginning of the French Revolution, the sumptuous, grandiose and opulent palace of Versailles became the architectural manifestation of absolute monarchy in France. Originally a hunting lodge built by Louis XIII, a string of celebrated architects, landscape artists, painters, and decorators turned the palace into one of the most costly and extravagant buildings in the world.